The INU Academic Planning Committee selected the following participant in the 2015 INU Student Seminar for Global Citizenship and Peace as the recipient of the award. Rodrigo G. de Souza articulated in his essay a deep understanding that peace and commitment to global engagement are achieved through partnership rather than through competition. Recognizing that the current competitive global climate leads toward a “nationalistic race to the bottom,” he advocates for partnership that truly leads to solving global issues. 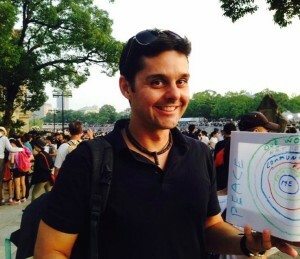 While acknowledging that this is not an easy path and that global citizenship is a challenging idea, Rodrigo provided an insightful and convincing argument that meaningful personal interactions in multicultural and international contexts have transformative power that result in the formation of global identity. He described his observations of empathy and perspective taking within himself and other participants in the Student Seminar as key to gaining deeper understanding of other cultures and forming partnerships. At a global level Rodrigo advocates for moving beyond national borders and supports greater regional integration, which may lead to achieving a more global and peaceful society. Rodrigo aspires to work in the field of peacebuilding and conflict resolution at governmental and nongovernmental institutions. Rodrigo G. de Souza is currently studying at Malmö University, Sweden. He identified James Madison University as an institution where he would like to spend a semester as an exchange student.